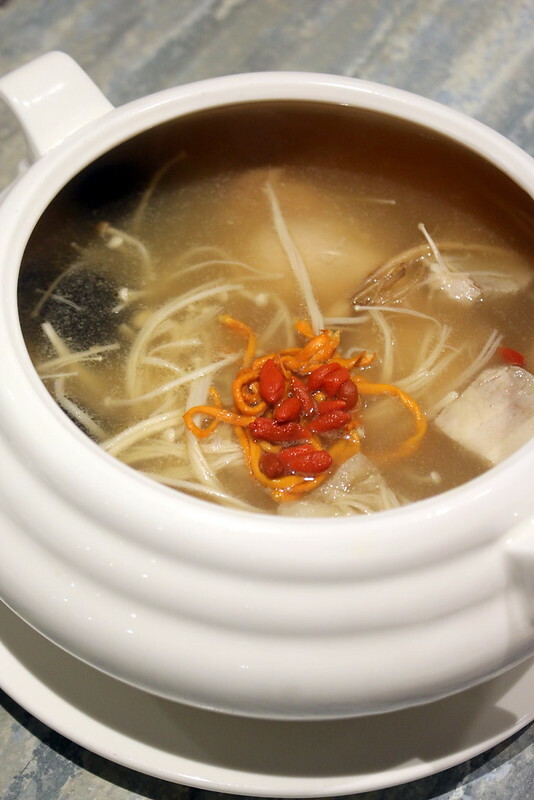 Chinese herbal soups are akin to delicious medicine rejuvenating not only body but soul. Traditional Chinese Medicine (TCM) uses different herbs and types of food that are categorised as ‘warm’, ‘cool’ or ‘neutral’ to help us gently calibrate our yin and yang balance for smooth flow of "qi". The older I get, the more I believe in its efficacy. I'm at least appreciating the taste of the soups a lot more. But there aren't that many places that serve good medicinal soups. How many can you name? Enter Souper Tang (汤师父), an established brand for nourishing Chinese soups and cuisine in Malaysia with 18 outlets. They opened recently in Singapore at Centrepoint in June 2016. There's a nice background story about the owners. Datin Sri Dato’ Cynthia Teh and her husband – a qualified TCM doctor – started out running their own medical hall in 1991 in Johor Bahru. Datin Sri Cynthia would also brew nutritious soups for her staff daily out of concern for their well-being. Gradually, customers began asking her for advice on how to brew herbal soups at home and for tips on incorporating Chinese herbs in their cooking. Her generosity in sharing knowledge and her genial personality endeared her to the local community. In 2009, a local shopping mall approached Datin Sri Cynthia to open a restaurant on its premises serving soups. The family then expanded the menu to include simple mee suah (wheat noodle) dishes, and communal-style mains. One outlet led to another, and Souper Tang started winning awards including the Asia Pacific International Honesty Enterprise Keris Award in 2015, and many SME business awards. This is their first international outpost. Their soup menu comprises 12 types of double-boiled soups that try to maximise the benefits of the herbs without compromising on taste. This pot is the ultimate chicken soup. It's teeming with conpoy (dried scallop), shiitake mushrooms, American ginseng slices, ginseng root, cordyceps flower and fish maw. Whole pieces of chicken and glutinous rice wine add depth of flavour. Benefits: This soup helps to regain vitality and ‘qi’ (energy flow) while boosting vitality and concentration. It also boasts anti-ageing qualities. This is one of the most palatable Shi Quan soups I've ever had. Most others have a strong medicinal and almost bitter taste. This one is more like a dark pork rib soup. It certainly looks potent still, but I don't know how they managed to rub out the bitter aspect. Shi Quan is one of the most common herbal formulas in Chinese medicine, with ten herbs (such as angelica root, rehmannia, and osmanthus bark) giving the body an all-round boost. Benefits: It is a ‘warming’ formula that helps nourish the immunity system by stimulating the appetite. The herbs also reduce vertigo and help ease the symptoms of insomnia. Other soups include Panax Ginseng Chicken Soup 人参鸡汤 (S$15.90), American Ginseng Soup with Black Chicken 花旗参乌鸡补 汤 (S$15.90), Tian Qi Nourishing Soup 田七活血汤 (S$13.90) and Gelatin Ba Zhen Nourishing Soup 花旗参乌鸡补 汤 (S$15.90). 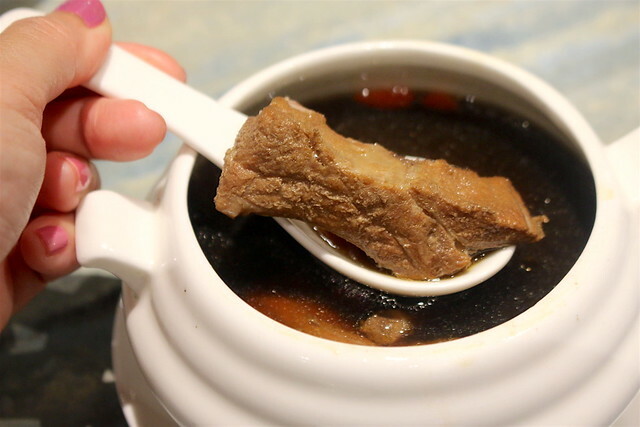 The Mountain pepper pork tripe soup with spare rib 山胡椒猪肚汤 (S$33.90 for three to four) on the menu caught my eye, as peppery pork tripe soup was a favourite of mine growing up. But the portion is so huge, and no one else in my current family will eat it. I seriously hope they will introduce smaller portions for this. 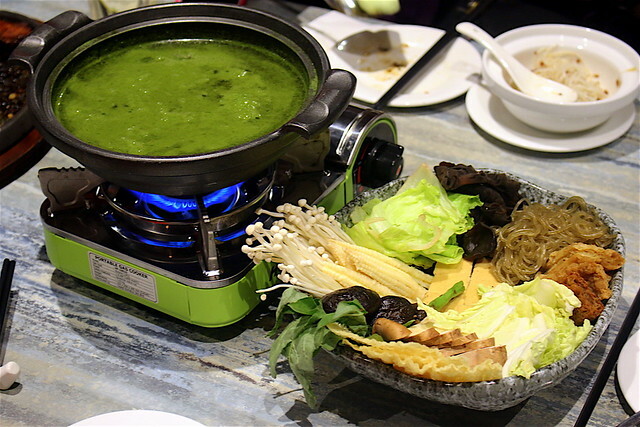 Meanwhile, Souper Tang has many other dishes that incorporate nutritious ingredients. One unusual standout dish is the Signature Souper Pesto Pot 活力绿叶汤锅 (S$25.90 for two to three). Pesto hotpot? It sounded a little strange at first, but made sense when we tasted it; it's almost like the broth in Thunder Tea Rice. The secret in-house pesto is a mix of green vegetables and other ingredients such as basil, mint, daun kesom (laksa leaf) as well as pine nuts. This soup is accompanied with a basket of vegetables such as Chinese spinach, corn, enoki and eryngii mushrooms, thick beancurd skin and beancurd sheets, tau kwa (firm tofu), a unique variety of black fungus known as “Little Cloud” and red sweet potato noodles. It's perfectly suitable for vegetarians. 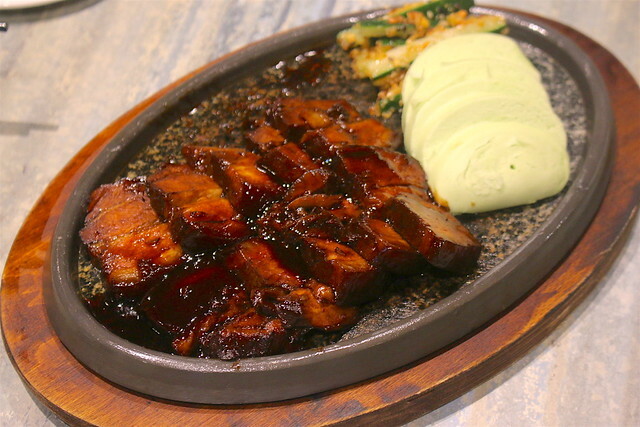 Meat lovers will no doubt gravitate to the Home Braised Pork Belly in rich dark sauce 茶花卤肉 ($18.90), cooked with oolong tea, angelica root, star anise and orange peel for 45 minutes. The tender pork slices are served with homemade spinach mantou (bun) and refreshing cucumber sticks coated with a crispy walnut, sesame and broad bean sauce. 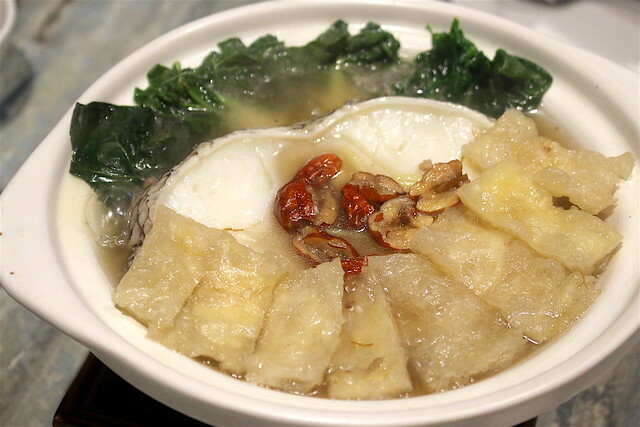 One of the highlights here is the Claypot Atlantic Codfish with Fish Maw 香煲鱼鳔煨鳕鱼 (S$29.90) which is a whole codfish fillet braised in a rich seafood stock with fish maw, red dates and stalks of leafy nai bai. The resulting dish is as nutritious as it is delicious, what with the high protein content and Omega-3 fatty acids. 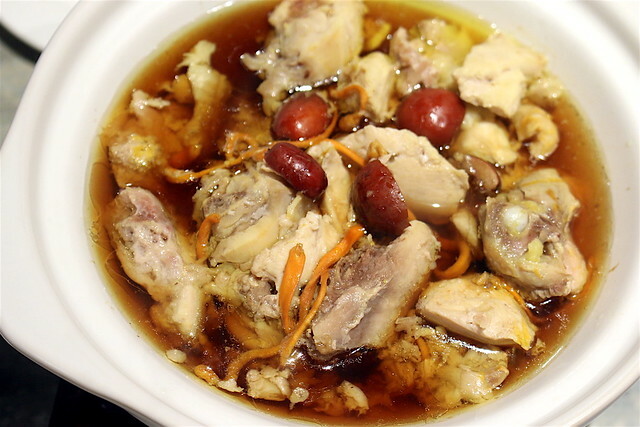 The Steamed Chicken with Cordyceps Flower and Essence of Chicken 虫草花鸡精蒸园鸡 (S$19.90) makes use of free-range chicken, ginger, goji berry and red dates. A bottle of Souper Tang’s chicken essence (said to be good for improving immunity) is added tableside. While it is pleasantly savoury, this dish tastes a little ordinary compared to the other stellar dishes and soups we had. The Stir fried French beans with pu er 四季普尔香 (S$11.90) is good if you want to add some fibre and up the vegetable intake. 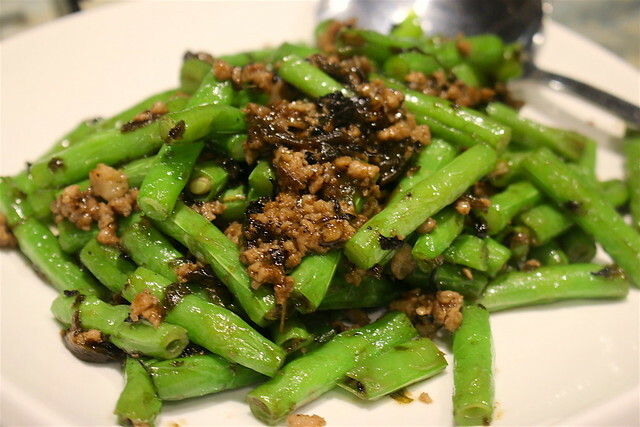 The crunchy beans is topped with braised minced pork mildly flavoured with pu er tea. Mee suah tossed in abalone sauce (S$3.90) is also available as an accompaniment to dishes in place of white rice. I am not a fan of mee suah but this was really superb. There are other popular renditions of mee suah as well, such as Sesame oil chicken mee suah with egg 麻油鸡面线 (S$11.90) and ‘dry’ versions like the Mee suah with dried scallops and abalone slices 瑶柱鲍片溜面线 (S$11.90). Souper Tang also has one dish meals for those after a quick and convenient meal. There are rice sets, such as the Dried scallops & petite abalone mixed rice 千贝鲍仔烩饭 (S$13.90); generously topped with whole baby abalones and mushroom nibs that have been stir-fried in a rich conpoy-based superior soup atop a mound of steamed white rice. Other bowls include Simmered sesame chicken pot 石锅麻油鸡饭 (S$12.90), and Souper braised pork rice 招牌石锅卤肉饭 (S$10.90). Each set includes a bowl of light vegetable soup. Vegetarian diners will enjoy the Homemade pesto vegetable rice pot with pine nut 绿叶锦饭 ($10.90), which comes with the signature pesto soup. The menu also includes a variety of congee like the Dried scallop porridge with whitebait 瑶桂银鱼杞子粥 (S$9.90) and Fish porridge with bei qi 瑶桂北芪鱼片粥 (S$9.90). I didn't get to try these but they sound interesting enough for a return visit. Whatever you do, do not miss the chilled beancurd dessert here. The homemade Caramel ginger beancurd 焦糖姜汁豆花 ($3.90) is so soft, smooth and silky. 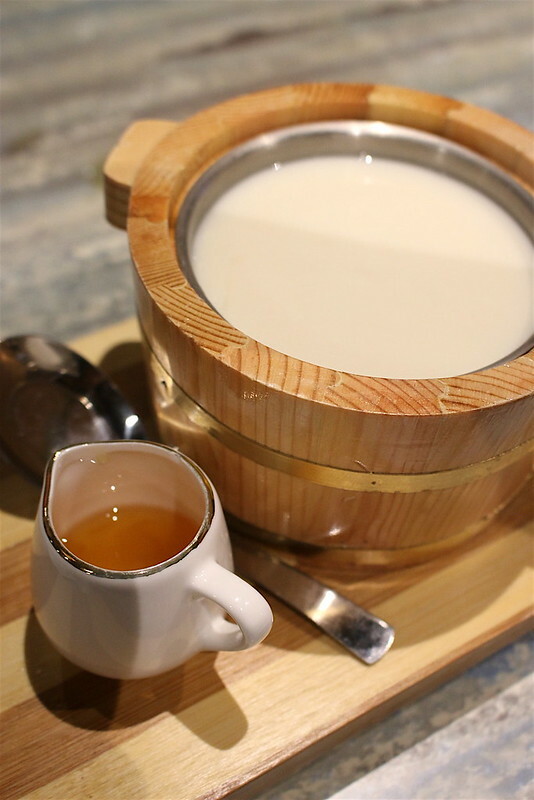 The ginger juice-infused caramel syrup is surprisingly spicy and adds sharp contrast to the milky dessert. Other options include Snow jelly with gingko nuts 雪蚵白果养颜汤 ($8.90) and the Wild honey longan & gingko 野蜜杏桂圆汤 ($4.90). Souper Tang also has a retail corner located within the restaurant. 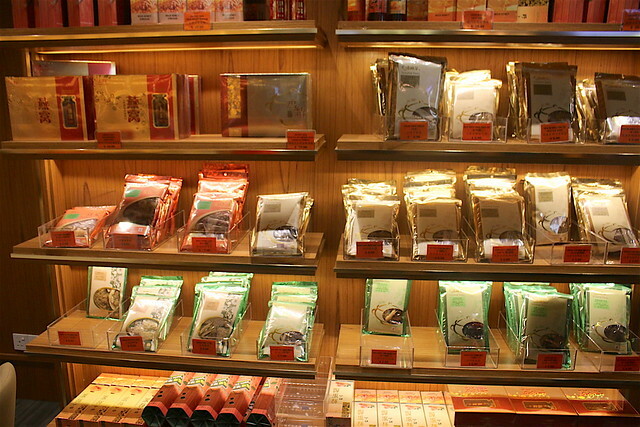 Customers may purchase pre-packed herbs for soups, floral teas, bottled essence of chicken and bird’s nest with white fungus, canned seafood such as abalone, clam and topshell, as well as bottled wild honey, honey vinegar and apple vinegar. Thanks to Souper Tang for the invitation.